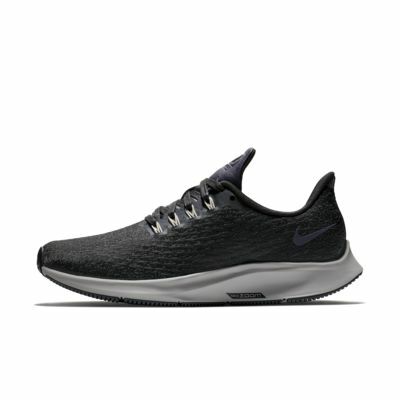 I, like others, purchased the grey/black color and they shockingly do have a purple tint to them. I personally don't mind, and the leather tongue and metal aglets are a really nice feature above the standard version of this shoe. I like the one piece upper design, and it feels sturdy enough to hopefully not rip near the toes. Sizing is consistent with previous versions of this shoe. I have exclusively run in Pegasus for the past 5 years or so, and these are another great pair. I wear running shoes most of the day just in case I get a spare block of time to run, so I need shoes that look great, are comfortable for all-day wear, and are good for running. Not as easy as one might think. Pegasus are great for this, and these fit just like pegasus, but look a little nicer. I purchased the grey like a couple of the other reviewers, but expected the purple undertone bc you can see that the tongue is purple, so you'd assume that the base layer of the upper is purple. The upper overlay is grey and mesh, so you'd expect to see the purple through the mesh overlay. Ultimately, the color is purplish-grey. I wear them with all black, black and grey, grey and any soft pastel-ish colors. They're as breathable all day as my other pegasus. The biggest different to me is the shoelaces, which have no give, so are a little harder to tie, but the aglets are heavy woody/metallic material and hardly ever come completely untied. I've had these for 3 months or so.